As you can see from the image on the left (just click on it for a larger view) this website is now available in 35 different languages, including my poor and often wrong English. Obviously, they won't be perfect, since it will always be a computer to perform the translation procedure, but at least it will help people who can't speak English to understand what's written here. I already had this feature before thanks to Altavista's BabelFish translations, but it supported less languages and translation quality was not overally much different than Google Translator's one, which I'm using now. To translate this page, just locate the Google Translate button in the right column of this site, and select your language. 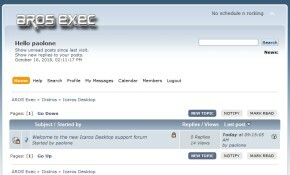 This is not the only change I have made to this site: I've also added links to most recent post in Aros-Exec forums.